The early series of Topps' 1969 set showed Pilots players in their previous team's uniform, usually with the logo poorly airbrushed out. Photos for the later series were taken during spring training at Pilots Field in Tempe, Arizona. Thanks to Jon Rizzi for his help in assembling this section! 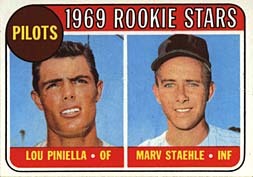 The 1969 Pilots Rookie Stars Card (#394). Everyone knows Lou Piniella never played during for the Pilots the regular season, but neither did Marv Staehle. The background of this page is the same color that appeared on the back of the 1969 cards.